People often feel that to make a seriously delicious and truly authentic Italian meal it takes a breadth of culinary technique and knowledge or an exhaustively complicated recipe. If I learned anything from my two weeks in Rome and Positano last May, it's that Italian food is far more simple than many home cooks realize. All it takes is some basic Italian flavors, quality ingredients, and a little heart and soul in the kitchen. This recipe screams both yummy and clean. In fact, this cherry tomato sauce had to be one of my absolute favorite things I got to cook with Salvatore at Il Ritrovo. I get to indulge my Italian cravings, but I also feel like I've had a healthy and fresh meal that won't tip my ever looming scale. 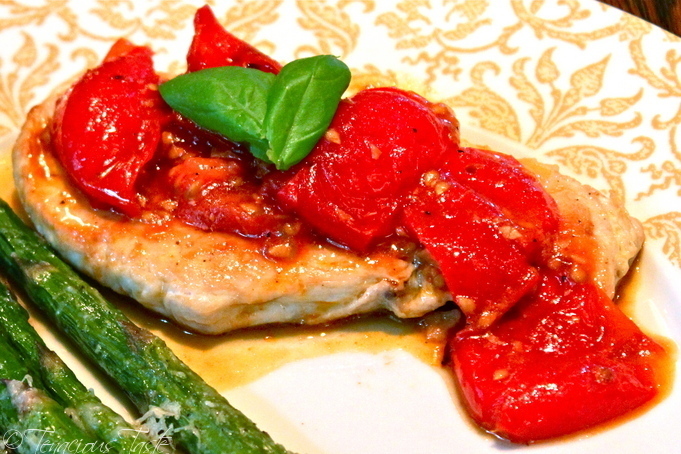 So keep it "simplice e pulito", simple and clean, with this quick and easy Italian dinner. Grate fresh parmesan and set aside. In a separate bowl or tray, coat asparagus with 1/2 tbs of olive oil, salt and pepper. Cover roasting pan with aluminum foil for easy clean up. Spread asparagus in one layer across roasting pan. 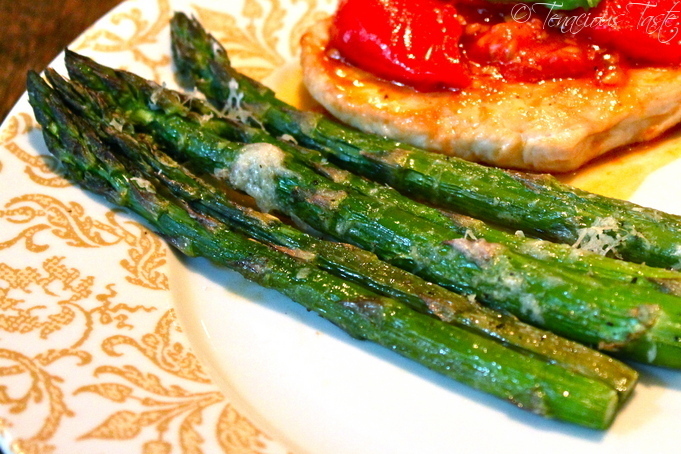 Sprinkle parmesan over asparagus and squeeze lemon quarter across top. Roast for 30 minutes, until asparagus are tender but still crisp. Heat saute pan over medium-high and add 1/2 tbs of olive oil. Wash tomatoes and slice some (not all) into halves. Season chicken with salt and pepper, then dust lightly with flour. Add chicken to the pan over medium-high, cook 3 minutes on each side until browned. Remove chicken with tongs and set aside. Add white wine to pan for de-glazing, scrapping off chicken bits from bottom of pan with a wooden spoon. Add garlic and another 1/2 tbs of olive oil to de-glazed pan. Carefully dump tomatoes into pan and let cook for 2-3 minutes, stirring occasionally. Once whole tomatoes become plump and even brighter in red color, take potato masher and crush the tomatoes. Return chicken to pan and coat with tomatoes, allow to cook at medium-high for another 2 minutes then reduce to medium-low. Squeeze a lemon quarter over chicken and sauce to brighten flavor, cook for an additional minute. I love the brightness white wine adds to the tomatoes, but you can just as easily de-glaze with a little chicken broth if you like. Just remember to use quality wine or broth! No store-bought "cooking wine" or sodium overloaded watered-down chicken stock. Only use something you would drink/taste. Just because you are adding it to lots of other ingredients, doesn't mean the low-quality won't be noticed. When in doubt, taste your ingredients yourself before adding them to your dish! Sometimes your tomatoes can be overly-juicy. In this case, your sauce may seem a little watered down. To keep the liquid on low, remove the chicken at the end of the recipe and keep warm with foil or inside of a warming drawer. Then return the saute pan to high heat and allow to reduce for a few minutes. This may concentrate the sauce a little more, but it will only be more delicious! Just be careful not to burn those savory tomatoes! For a more hearty dish, boil a little capellini pasta in salted water. Drain and coat with a little olive oil or butter, red pepper flakes, and chopped parsley. Serve as a side or stack asparagus and chicken over pasta and top with sauce. 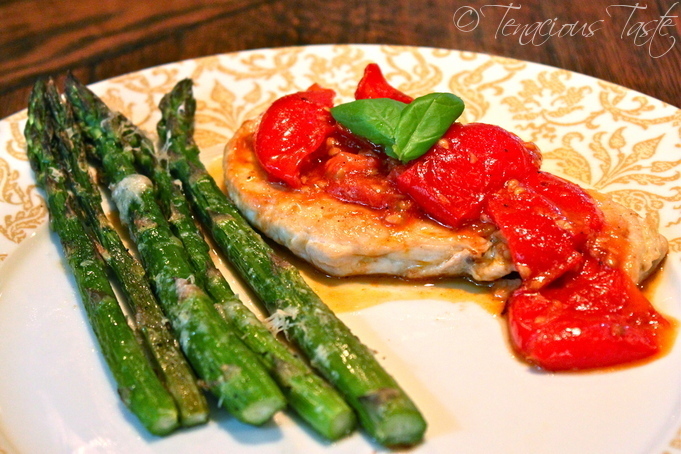 Because of the seasonality of the asparagus and tomatoes, this is traditionally more of a spring dish. But, you can always use frozen asparagus and any tomato variety still available at your local supermarket. The lemon may seem out of place in this recipe, but in Positano, lemons are utilized in so many more ways than typical citrus dishes. Just a few squeezes can really highlight the flavors of the sweet tomatoes and tangy parmesan over the asparagus. Just be careful not to add too much. The lemon is used as a catalyst to bring out flavor here, not to stand out as one of the flavors. If your tomatoes are a bit on the acidic side, which they may be in these colder months, adding a 1/4 tsp of sugar to the sauce may help mellow them out.